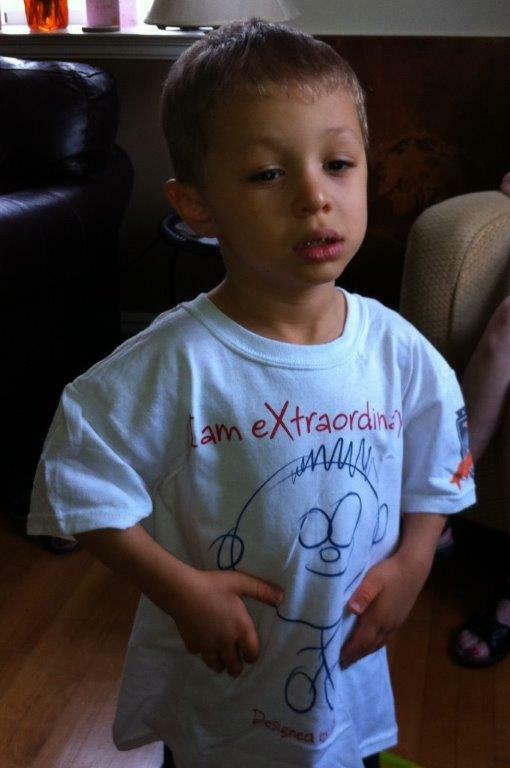 Our Fragile X journey began 3 years ago with the official diagnosis of Fragile X. We were led in the direction of Fragile X when an OT working with Liam, asked if he’d been tested for Fragile X. I googled Fragile X the minute the OT mentioned it. Our family fit the description almost perfectly. My oldest daughter had suffered from sensory issues since a very young age and by the age of 9 was suffering from anxiety and exhibiting OCD tendencies. Then came Liam who was behind in so many areas and nonverbal. And the final piece of the puzzle was my father. He was a late talker, had been diagnosed as bipolar, and developed what was thought to be Parkinson’s late in life, which I now believe was actually FXTAS. Liam’s initial genetics screen after he began exhibiting delays at 18 months did not include Fragile X so we requested the test. About 10 weeks later, when I seriously had almost forgotten we tested him, we got a call saying he had Fragile X. A feeling of relief from knowing the cause of Liam’s delays and struggles came flooding over me. Not knowing about this part of my genetics meant there was nothing I could have done to prevent having a child with Fragile X. I feel pretty lucky that of three children, only Liam has Fragile X. As a female, I could have passed on the bad X to all three of my kids and quite often many families have multiple affected children before they get a diagnosis. I did not dwell on the bad genetics for long. I was just thankful to know what was causing Liam’s delays and problems. It gave me a focus, a direction to look for his future. That was the beginning of this journey we are now on for the rest of our lives. From the moment we got the Fragile X diagnosis in March of 2010, I spent an endless amount of time reading, researching, digesting as much as I could about Fragile X. Exciting new findings and new drugs on the horizon gave me so much hope for Liam’s future. How great was the news that I kept reading – they knew exactly what was missing in my little guy’s brain chemistry and some very smart researchers were working to find targeted treatments for Fragile X! I began counting the days until Liam was 5 and could participate in a drug trial. The drug furthest along in the FDA trial process was STX209/Arbaclofen. Liam just needed to be age 5 and I was quite impatiently waiting. I listened to the stories on Facebook of the success families were having on it. I witnessed the excitement from all the new accomplishments their kids were making. I attended the International Fragile X Conference last summer and listened first hand to the researchers talk about the drugs and the trials. I was more excited than ever. We were getting so close! Last October 1st, Liam turned 5. We enrolled in the STX209 trial and started the meds in December. From December to March 1, we had no idea if we had the med or not. We were watching for any little sign. I definitely thought we saw a calmness come over Liam. He had better focus, his stimming greatly decreased, we were convinced he was getting something. We just had to get through this blind period to actually get the golden ticket — the open label portion of the trial. We would really get the drug then and I was convinced everything would just take off and Liam would do amazing things we never thought possible. I had all the hope in the world, but as with many things in our lives, it didn’t go quite as planned. As we titrated up on the drug, we didn’t see any great strides in Liam. When we reached the highest dose for his age (30 mg/day), we knew instantly it was not the right dose. Liam was hyper, waking for hours at night, and going like an energizer bunny all day. We quickly requested a reduction in dose (20 mg/day). We stayed at the dose for about 4 weeks. Things got a little better but still we weren’t seeing dramatic improvements like I kept hearing from so many other parents. We actually had more aggression at times and new behavior problems at preschool. My worst fear was coming true. Arbaclofen was not going to be our magic bullet. Knowing our children are all affected so differently by Fragile X, I knew it was highly likely that just because the drug worked so well for some didn’t mean it would have the same effect on everyone. We dropped down one more dose level to two 5 mg pills a day. Our next trial appointment was approaching and I was pretty certain if we didn’t see something great soon, I was going to request to wean Liam off Arbaclofen completely and get ready to enter a different drug trial this summer. However, we never had that appointment. We never had the chance to really evaluate if the 10 mg dose was going to be better for Liam. The email from Seaside came to the clinics on May 15 announcing the end of the open label trial of STX209, less than 1 week after we started the 10 mg dose. I wasn’t going to have to decide if this dose was better for him or if we needed to stop the trial. Seaside made that decision for me. Arbaclofen was being taken away from all of us. Liam is now completely weaned off the STX209/Arbaclofen, and we are realizing the positive effects the drug did have on him. His anxiety level was much lower on Arbaclofen. Particularly, it removed his highest anxiety — fear of height. He had gone from barely crawling up or down steps with assistance to constantly climbing up and down at will. Playing on the steps became a favorite pastime of his (and drove me to a constant fear of a fall). He is now back to barely crawling up and down steps, paralyzed with fear when he approaches them. He doesn’t even remember climbing them without fear and it has just been a few weeks since he last did. Some obsessive tendencies that had disappeared during the trial have also returned. He’s now back to needing an object in his hand constantly to flip and verbally stim over. Four weeks ago, Liam did not need something in his hand continuously turning it over and over. Transitions from activity to activity or from place to place have begun to cause full on meltdowns again. This had almost disappeared. It now can take 20 minutes after coming into our house before he calms down and readjusts to his home, the safest and most comfortable place he knows. So although not in a dramatic way, Liam benefited from Arbaclofen. It took losing the drug for me to realize it decreased anxiety, lessened meltdowns, improved transitioning, stopped his verbal stimming and reduced obsessive tendencies. Maybe with more time on the open label trial at 10 mg/day and the reintroduction of Zoloft into the mix, more improvements might have occurred. Maybe if the dose we felt Liam needed would have been available in this trial (3 X 5 mg /day), he would have had more growth and development. So many maybes and what ifs to which we may never get the answers. Now all we are left with are the daily heart wrenching stories as this life changing drug is ripped away from our children. I’m fighting for my son and his future. I’m fighting because Arbaclofen which seemed fast-tracked for approval is suddenly derailed by funding limitations as efficacy on the primary endpoint is proving difficult to show. I’m fighting because the positive effect of Arbaclofen is more than evident in all the stories being told. I’m fighting because there are more Fragile X targeted drugs in trials and additional compounds on the horizon that I FEAR will come to face the same efficacy challenges as Arbaclofen. I’m fighting to draw attention to this whole class of drugs and the need for different evaluation methods to determine efficacy. I’m fighting because I know one of these drugs is going to help Liam significantly and give him the life he deserves. I’m fighting because I can’t understand how those who have the ability to help, can just sit back and do nothing? It is all so very wrong and unfair! I do totally agree with you this is so wrong give these kids a chance at a any kind of a normal life as they can possible get don’t keep taking it away from them.That is their safe haven. Go get ’em Ruth and Liam! God Bless you and your family…. @Roche @STX209_Stories: Liam: I can’t understand how those who have the ability to help, can just sit back .Well said. Please share. If you are looking to write about STX209 or drug trials generally and wish to contact any of the families please send an inquiry to stx209story@gmail.com.